This is an another rice recipe, prepared from beetroot and rice. Cooking with rice is really easy for South Indians, because rice is the regular part of South Indian diet. This is an another lunch box idea. My husband likes different types of rice in lunch box, that is why I, always, try something new and less time consuming rice items. This is served for breakfast as well. This is healthy and delicious too. Beetroot is an interesting vegetable to be added to rice, it gives rice its natural colour and a natural sweetness to the rice and that makes this dish really tasty and unique. And more over beetroot is low in fat, full of vitamins and minerals and packed with powerful antioxidants. This is a very simple recipe, can be prepared in less than 30 minutes.A perfect dish for lunch box. Wash the rice with plane water and soak it in water for 10 minutes. Soaking the rice before cooking helps to soften the rice after cooking. If you are using Basumati rice, you can add 2 cups water for 1 cup of rice. If you are using Sona masoori or any other type of rice, you can add 2 ½ cups of water for 1 cup of rice. Cook the rice in electric rice cooker or pressure cooker, whechever cooker is available in your kitchen. I, always, use electric rice cooker for cooking rice. Rice will get cooked perfectly, fluffy and tender as well. Using electric rice cooker is a simple and effective way to cook rice. Rice cooker keeps the rice warm after it’s cooked. There’s no need to watch the rice cooker since this appliance comes with an automatic timer that clicks when the rice is ready. Wash beetroot, peel off skin and cut it into small pieces. Chop the onion, coriander leaves and green chillies into small pieces. Keep them aside separately. 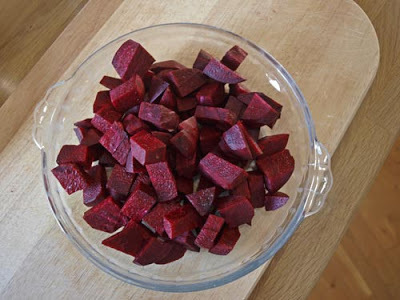 If you have microwave oven in your kitchen, you can use microwave oven for cooking beetroot. Otherwise, you can cook it on gas as usual. Heat a pan, pour oil in it, add mustard seeds and allow them to split, after splitting, add black cumin seeds (shahi jeera), cumin seeds (jeera) and chopped green chillies, one after the other (you can keep 10 seconds difference), stir it with a spoon, add curry leaves and chopped onion to it. Cook it untill onion starts leaving aroma, it may take 5 minutes. Add chopped beetroot to it, sprinkle required quantity of salt (1 1/2 tea spoon) over it. Mix it well so that salt should spread all over. Close the pan with lid, allow it to cook on low flame for 10 minutes. No need to open the lid in between. Open the lid after ten minutes, check whether beetroot is cooked completely, if not, you can sprinkle a few drops of water over it, close the lid and cook it for further 5 minutes. While cooking the vegetables, if you sprinkle salt over it. It will help to retain the colour and flavor of the vegetables. Also it will be cooked evenly and softly, and it tastes good. Meanwhile, you can take out rice from cooker and Pour the cooked rice in a wide bottomed bowl, do not tamper it leave it as it is, if you tamper it, it will be mushy. Pour lemon juice all over the cooked rice. Once beetroot is cooked completely, open the lid, add red chilly powder to it and mix it well. Take out the cooked stuff from heat and spread all over the cooked rice evenly. Don’t mix the stuff immediately, leave it to set for 5-10 minutes. Mix the stuff very lightly. Spread the chopped coriander leaves over it. Serve it hot. Delicious and healthy Beetroot rice is ready to serve. You can prepare this dish with leftover rice as well.